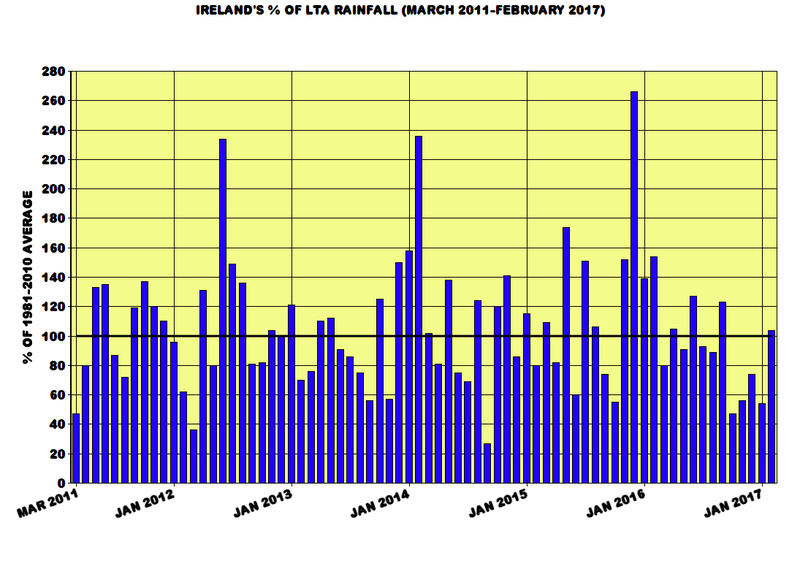 I've gathered Ireland's % of LTA rainfall for every month since March 2011 here in this graph below. Yes, they're not Grange's , they're Ireland's. Since March 2011, there has been three months with 200% or more of the average rainfall, June 2012, February 2014 and December 2015. There has been four months with 50% or less of the average rainfall, March 2011, March 2012, September 2014 and October 2016. I have highlighted the top 5 most extreme cold months and one of them is interestingly November 2016 . I will be updating this post every time a new colder than normal month takes place. Last edited by sryanbruen; 05-03-2017 at 22:20. I was just wondering if anyone here is able to answer this? When we say above or below average temperatures, rainfall, any weather, etc. How is the average worked out and how many years does it go back to, to work out the average? Is it always since records began or maybe the last 20 or 30 years? The average is based on a certain 30 year average. The most recent average we use is the 1981-2010 average. Before that, we used the 1971-2000 average and before that, the 1961-1990 average etc. So the next 30 year average will be 1991-2020. Of course, not all stations do it this way. For example, my station Grange (just as an example) uses the 1986-2016 average because my station's records go back to only 1986. Last edited by sryanbruen; 05-03-2017 at 23:40. Updated with the rest of 2010, 2009 and 2008 added now. Just opening this thread so as to have a place for others to post and keep on record Irish weather stats on a ongoing level. I noticed last night that Syran posted some incredibly detailed stats on the 'Spring' thread which no doubt took a lot of work and research to compile. I think such stats would be better placed in a dedicated thread like this, because they will be lost and forgotten in the other thread once numerous posts come in discussing the first 17.0c being reached in late March or April. I'll start off the thread with a trivial stat. Up to yesterday, Ireland as a whole has seen 38% less rainfall since the start of the year than in the same period last year. 21st March 2013 was very wet in places. Cork AP had 42.0mm but there were plenty places wetter. Cork Apt had 41.2mm on Mar 21/13, so yep, a wet day, but the recent event was wetter on a more national level in general. Interestingly, Winter 2016/17 was +0.1c warmer than Winter 2015/16 was in Ireland. Mod Note: I have move sryan's posts into this thread, but, I can't change the order as they are always sorted chronologically. Not a problem , I appreciate the move very much. I see your confusion no worries. I forgot about 21st March 2013 . Probably because it was the worst day of my life and I don't want to remember it. I dread March 21st every year. But you're right anyway. These are great Stats syran. Have you any for Summers of 2007 - 2012. In Sligo I remember these being incredibly bad cold wet and dull. I wonder was it the same countrywide. Interestingly I am sure that 2016/17 Winter the Northwest was one of the driest places in Ireland. March will be our first > 100mm month for rainfall in 5 or 6. That temperature anomally charts great. I was going to do one with the rainfalls but Im not as dedicated as yourself. Thank you . If I have time tomorrow, I will put up stats on those Summers, it won't be a problem at all for me to do them for you. what do you mean by "Ireland's"? How is it calculated?